The Freedom From Religion Foundation will be bringing a celebration of secularism and irreverence to the Bay Area the weekend of Nov. 2-4. 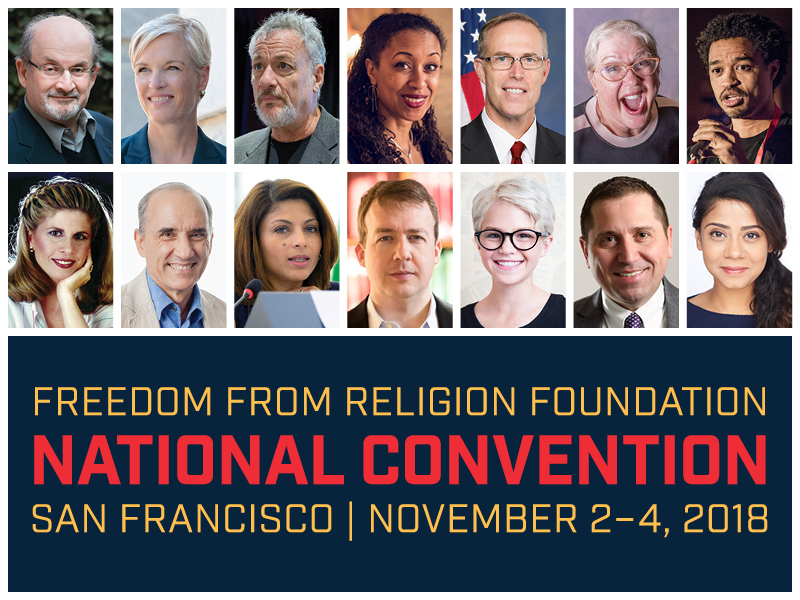 Nearly 1,000 freethinking attendees will be in San Francisco for FFRF's 41st annual convention, headlined by best-selling author Salman Rushdie, reproductive rights icon Cecile Richards, "Saturday Night Live" alumna Julia Sweeney and stand-up comedian Leighann Lord. Receiving an "Emperor Has No Clothes Award" will be U.S. Rep. Jared Huffman, D-San Rafael, representing the 2nd Congressional District of California, and co-founder of the new Congressional Freethought Caucus. Debra Deanne Olson, the granddaughter of Culbert Levy Olson, California governor from 1939-1943, will be talking about his open atheism in office, including his refusal to place his hand on a bible when taking the official oath. She and Dr. Craig Wilkinson have co-authored a new book about "The People's Governor." Actor John de Lancie is best-known for portraying "Q" in the TV series, "Star Trek: The Next Generation," but has also portrayed Clarence Darrow, and fittingly will be receiving FFRF's first "Clarence Darrow Award." De Lancie, a science educator, helped dedicate the 7-foot statue of Clarence Darrow that FFRF commissioned and placed last year on the lawn of the Rhea County Courthouse, home of the Scopes trial. Sweeney, who's done a one-woman play, "Letting Go of God," is joining the cast of "Shrill" (Hulu), playing opposite SNL cast member Aidy Bryant. An entire conference afternoon will be devoted to the work and plight of ex-Muslims who become nonbelievers. The first annual Avijit Roy Courage Award of $5,000, in memory of the Bangladeshi-American author assassinated as an atheist in 2015 by Islamists, will be accepted by a founder of Roopbaan, Bangladesh's first gay periodical. Its co-founder Xulhaz Mannan was hacked to death in 2016. On hand to dedicate the award will be Rafida Bonya Ahmed, widow of Avijit Roy, who was critically wounded in the 2015 attack and has continued to help threatened secular activists. Ensaf Haidar, the wife of currently imprisoned Saudi freethinker and blogger Raif Badawi, will be receiving the second annual Henry Zumach Freedom From Religious Fundamentalism Award of $10,000. Sarah Haider, co-founder of Ex-Muslims of North America, will receive FFRF's "Freethought Heroine" award and Mohammed Al Khadra, whose life was endangered after co-founding the Jordanian Atheists Group, will also speak. Secular U.S. activists will also be honored, and a panel of FFRF attorneys will deliver "On a Roll," a report highlighting FFRF's ongoing legal successes in defending the First Amendment. The youngest speaker and honoree will be Bailey Harris, 12, author of the book "My Name Is Stardust." In addition, the convention will feature the popular annual drawing for "clean" (pre-In God We Trust) currency, musical interludes by FFRF Co-President Dan Barker at the piano, and FFRF's annual "Non-Prayer Breakfast." "With so many current threats to our secular nation, we at FFRF are looking forward to celebrating prominent freethinkers and cultivating a renewed commitment to defending the wall of separation between state and church," says FFRF Co-President Annie Laurie Gaylor. FFRF is a national nonprofit organization with more than 32,000 members and many chapters across the country, including over 4,000 members and a chapter in California. FFRF's purposes are to protect the constitutional principle of separation between church and state, and to educate the public on matters relating to nontheism.